Point Pleasant senior Peyton Campbell (center) passes to classmate Lexi Watkins-Lovejoy (8), in front of GAHS freshman Preslee Reed (22), during the Lady Knights’ 4-0 victory on Tuesday in Point Pleasant, W.Va.
POINT PLEASANT, W.Va. — A rivalry is born. 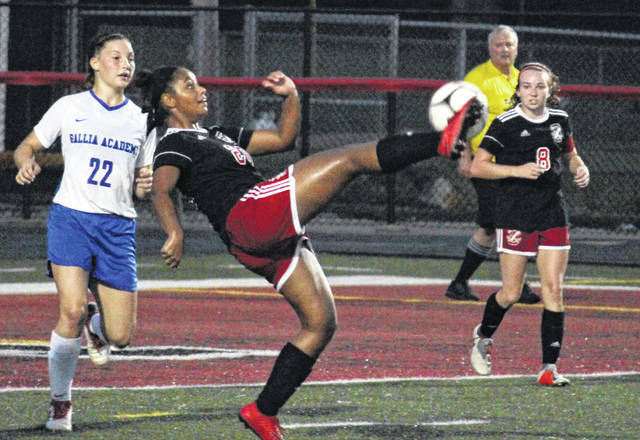 Point Pleasant and Gallia Academy met for the first time in varsity girls soccer on Tuesday night at Ohio Valley Bank Track and Field in Mason County, with the host Lady Knights pulling off a 4-0 victory over the first-year program. 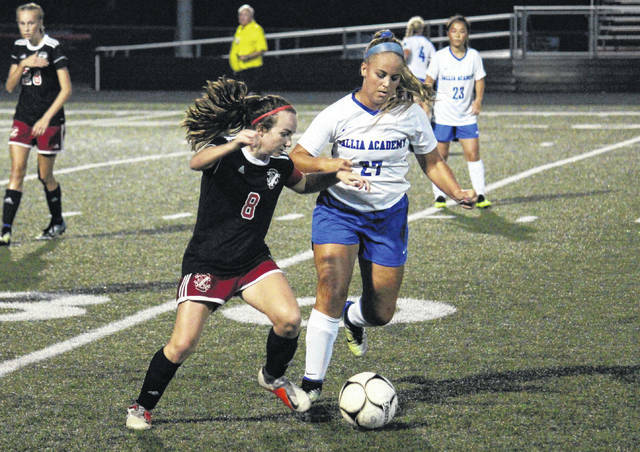 The Lady Knights (1-3-1) — picking up their first win of the season in their second home match of the fall — held Gallia Academy (3-1) to just one shot and gave the Blue Angels first-ever soccer setback. Point Pleasant went ahead 1-0 on a GAHS own goal following a corner kick. The hosts increased their lead to 2-0, as Ellie Wood scored on an assist from Lexi Watkins-Lovejoy. Still in the opening half, PPHS stretched its advantage to 3-0, as Teagan Hay scored on an assist from Kady Hughes. 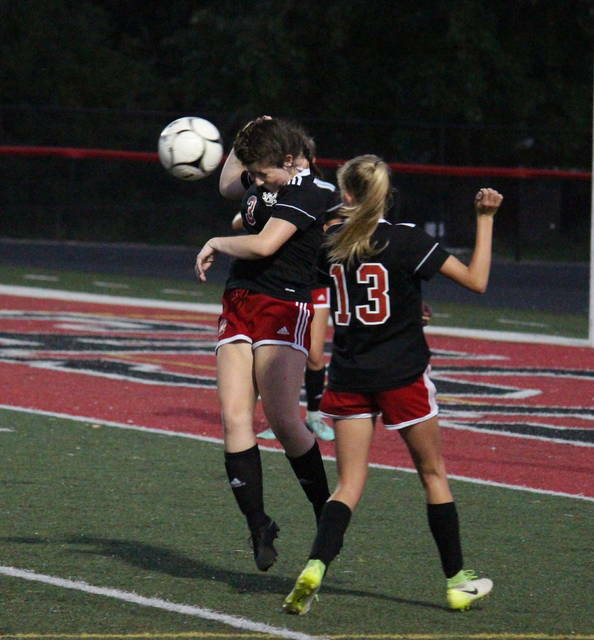 Following the break, Point Pleasant senior Peyton Campbell scored the game’s final goal on an assist from Morgan Miller. Following the victory, sixth-year PPHS head coach Chris Errett noted that it was nice to see his team’s offense catch up to the way the defense has been playing. “A shut out always looks good,” Errett said. “It’s something we try to focus on, defend first and try to create goals off of that. The girls have played good defense all season, so it’s nice to get some goals on top of that to get us a win. The girls created a lot of opportunities, I think they could have cashed in on a few more, but I thought they played well. 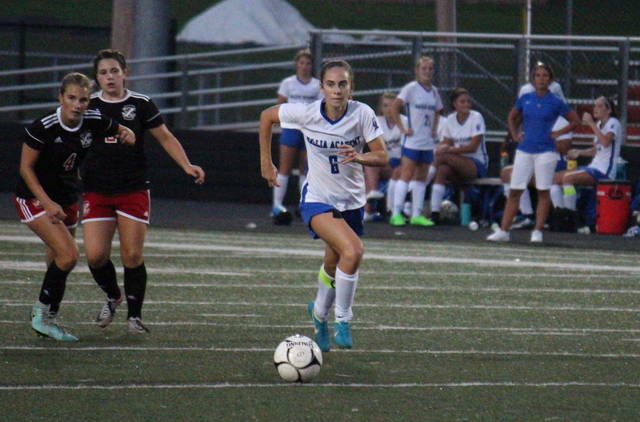 After the program’s first-ever setback, Blue Angels head coach Leah Polcyn noted that, while the winning streak may be over, playing an experienced PPHS team will only do good for her team in the long run. “I think we were feeling pretty good coming into the game,” Polcyn said. “We’re a brand new program, so to start the season 3-0 was pretty unexpected. PPHS held a 9-to-1 advantage in corner kicks and a 14-to-1 advantage in shots. Both teams committed five fouls in the contest. Alexis Nickels came away with seven saves for the Blue Angels, while Monica Cook had one save for the Lady Knights. Gallia Academy makes its home debut on Thursday against Fairland. Point Pleasant also returns to action on Thursday, with the Lady Knights taking a trip to Lincoln County. Alex Hawley can be reached at 74-446-2342, ext. 2100.